A few weeks ago, you learned about the superhero splendor that is the Valentino X Goop "Wonder Woman" collection. A capsule that was only a small part of a larger collection set to be released in April. Well, here now is yet another glimpse of how Valentino plans to superpower your wardrobe. The upcoming Valentino HERO collection will feature officially licensed pieces from BOTH DC Comics and Marvel! 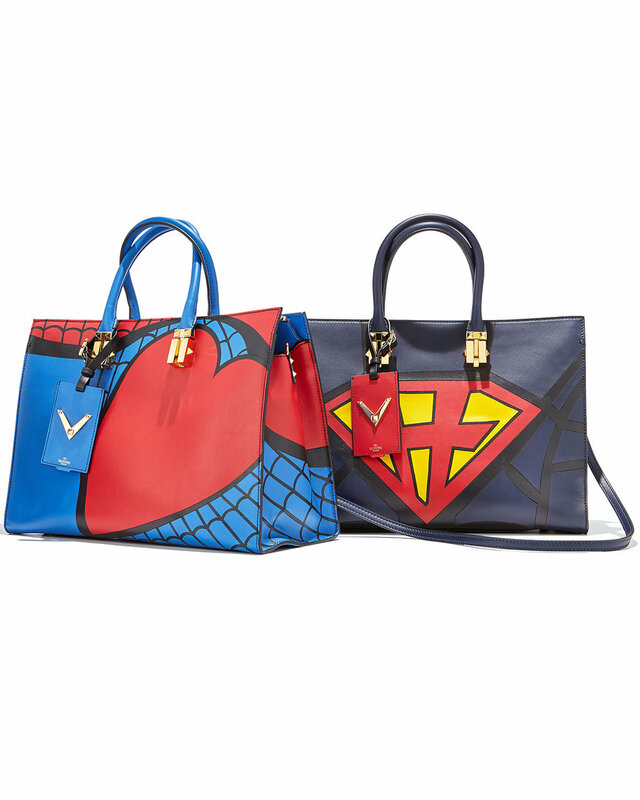 Seen below are new, whimsical takes on the signature Valentino Rockstud bags, inspired by iconic heroes: Spider-man, Batman (though in a Valentino twist, the bat logo is now a butterfly) and Superman. Exclusive to Neiman Marcus, these Resort '16 pieces are available for preorder NOW. And if you think these are gorgeous, take a look at the swoon worthy Valentino Spider-man jacket to follow! With a blog name like STYLEHEROINE, blogger Evangelie Smyrniotaki was a superb choice to rock this piece ahead of the Spring release. Look out for my review of the rest of the pieces very soon. What else are you hoping to see from this collection?